Okay, so you've got piles of photos at one end of the table and a computer at the other. Today we're going to look at how to get your images from the one to the other. Negatives are most commonly found in the same envelopes as the prints they produced. Prior to the 1980s, 35mm negatives were cut into strips of four or five and simply dropped into the envelope, where they were exposed to scratching simply as they rubbed one strip against the other. In the late 1970s or early 1980s, most processors began slipping the strips into independent plastic or wax paper protectors, which protected them from dust as well as scratching, yet allowed them to be inspected without removal. Home hobbyists who developed their own film, or professional photographers by request, may have kept the negatives uncut, on a single roll. The jury's still out on whether this was better for the preservation of the film or not in the long run; but there's no argument that such rolls can be most easily scanned in special film scanners made for the purpose. Not all negatives and slides were shot with 35mm film, of course. Popular film sizes I've encountered are 120/620 (the film is essentially identical; the spools were different), 127, 126 (Instamatic) and 110. Another variant is 35mm "half-frame" format, in which two pictures occupy the space of a single standard 35mm frame. 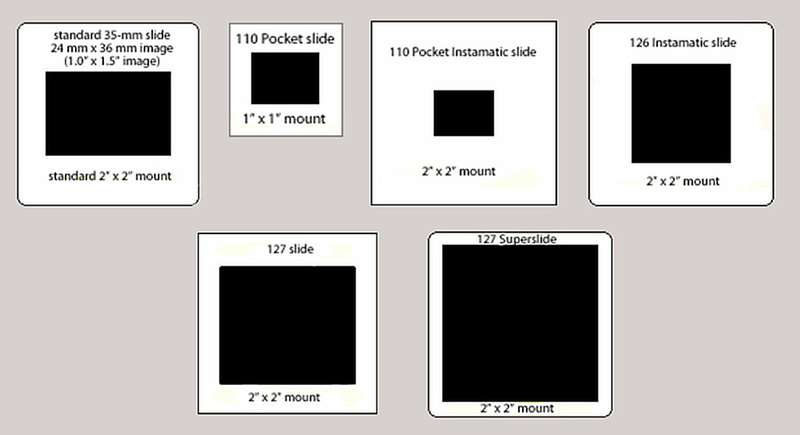 120/620 cameras took either rectangular photos, or square ones; and the rectangular ones might be one of two sizes, depending on whether the long side of the rectangle was perpendicular or parallel to the length of the film roll. The negatives were the largest used by amateurs from the early 1900s on, and are referred to as "medium format" (because even larger, so-called "sheet film" was used by professionals). 120/620 roll film is about 2.25" wide. You'll need access to a special scanner to digitize medium format slides or negatives. The 127 film size was introduced by Kodak in 1912, again for amateur photographers. The film, smaller than 120/620, was sold in rolls about 2 inches wide. Most, though not all, 127 cameras took square pictures. Consequently, unlike with 120/620, many people used color slide film in this format, which produced 2 x 2" mounted slides—the same as 35mm—but with a much larger (and square) picture area than 35mm. For this reason, 127 slides were often called "superslides." For some reason, Kodak never sold its finicky color slide film, Kodachrome, in this format. Instead, they offered Ektachrome, which used a different formulation and less expensive processing, in keeping with 127's amateur status. Unfortunately, Ektachrome has, through the years, shown itself to be more susceptible to fungus than Kodachrome, making it all the more important that you get your surviving Ektachrome slides scanned as soon as possible. Because 127 mounted slides are the same size as 35mm mounted slides, it is possible to scan this film size in any scanner that supports transparency scanning, as many units for the home market do. However, most of these scanners arbitrarily limit their scanning to a 35mm full frame area, which throws away a substantial portion of the image. For this reason, 127 format film is generally digitized by the same scanners used for medium format film. In 1963 Kodak introduced a variant of 35mm film they designated 126. This film, which was 35mm wide, had only one sprocket hole per frame and was pre-installed into a plastic cartridge to simplify loading and removal from the camera, even in bright light. Images were 26mm square, and could be mounted as slides that were compatible with 35mm slide projectors. The fact that 126 negatives and slides are both taller and skinnier than 35mm negatives and slides, is problematic. Standard scanners tend to get confused, in their effort to "simplify" the scanning of 35mm film for which they were designed; and part of the picture will be truncated. Professional scanning houses tend to charge an amount per image that is intermediate between that of 35mm and medium format images, and are usually the best way to address this problem. With the success of the Instamatic camera, in 1972 Kodak decided to appeal to those who wanted even smaller cameras, with the Pocket Instamatic camera. This camera made use of 110 film cartridges, similar in many ways to the 126 cartridges but even smaller, using film that was only 13 x 17 mm wide (resulting in a slightly rectangular photo). Although it was possible to take high-quality pictures with this format, most 110 cameras sold were inexpensive affairs with plastic lenses. As a result, pictures tended to be blurry and not suitable for enlargements. Keep this in mind while deciding on a target resolution for your 110 negatives and slides. Film strips were stored in the cartridge even after processing; they were never touched by human hands and so were protected from dust, scratches, and unnecessary exposure to light. The same film could be used to take rectangular, wide-screen, or panoramic pictures, intermixed. The film was coated with a transparent magnetic substance that allowed additional information, such as time and date taken and/or a caption, to be associated with the negative. Unfortunately the main drawback was that APS images were nearly half the size of 35mm negatives, allowing 8 x 10" enlargements to be made from only the very sharpest shots. Finally we have the workhorse, the film for all seasons, 35mm. 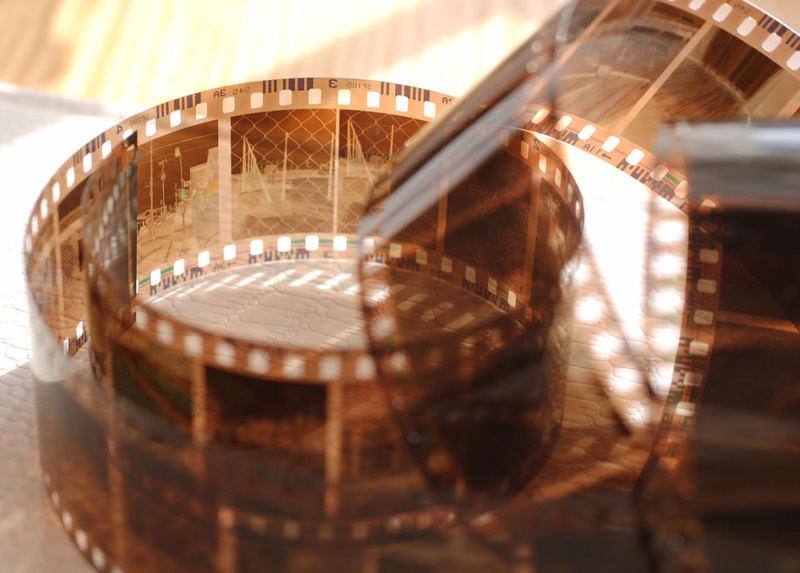 Originally used as motion picture film, 35mm was introduced (as "135") by Kodak in 1936. In the 1970s it exceeded the ubiquitous Instamatics in popularity, and remains so today. It is the only film size still manufactured by Kodak. Consequently, home scanners with transparency scanning capability are designed specifically for 35mm negatives and slides; and, if you have the time, you can certainly use these devices to scan your own. Scanners treat slides and negatives similarly; you just have to tell the software which you're scanning so it knows whether to invert the image colors or not. A question that will come up when you are scanning is, what resolution should you use? A lot of people are puzzled by the whole issue of resolution, so let me review it briefly here. So the issue of resolution boils down to: How small do you want your pixels? Or, conversely, how many do you need to represent your picture? —That's the topic we'll address next.